Rinse the fresh blue mussels in tap water. 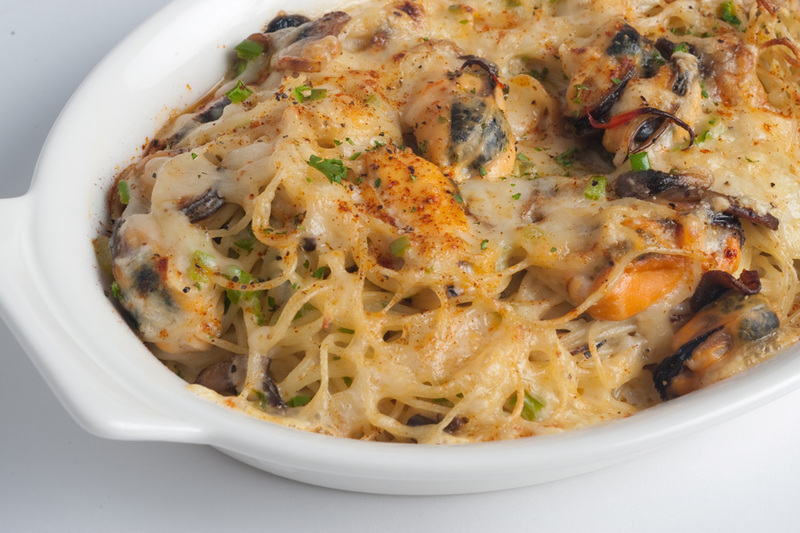 Place cooked fresh blue mussels and noodles in a 4-quart (4-L) casserole dish. In a large frying pan, melt half the butter adding mushrooms and green pepper. Sauté until tender. Remove from heat and place vegetables in casserole dish. Add rest of the butter to the pan, blend flour, and then milk. On a low heat, Add salt and pepper to taste, stir constantly until thick. Remove from heat, stir in wine (or broth) and pour sauce into casserole dish. Toss all ingredients to coat with sauce, sprinkle cheese on top and colour with paprika. Bake, uncovered, in preheated 350°F (18°C) oven for 45 minutes.